Want to win $200 off your next pageant? One "Lucky Duck" will win it! Qualify & Win Fees Off National finals!!! Come be a part of the VA AGM Family! Enter Virginia Grand Miss Now!!! will get door overalls for FREE!!! Saturday, July 17th Bristol, VA Bristol Mall Registration @ 1:00 p.m.
Saturday, July 17th Kingsport, TN Kingsport Town Center Registration @ 6:00 p.m.
Sunday, July 18th Morristown, TN College Square Mall Registration @ 1:30 p.m.
Would you like to enter AUE/AMerica's Best for FREE????? WOW we've added a Mega Ultimate Supreme to the contestant with the highest score at our Hurricane WV Prelim and they will receive their $500 package paid to AUE Nationals!! Isabel Can't Wait to See You in Hurricane WV!! 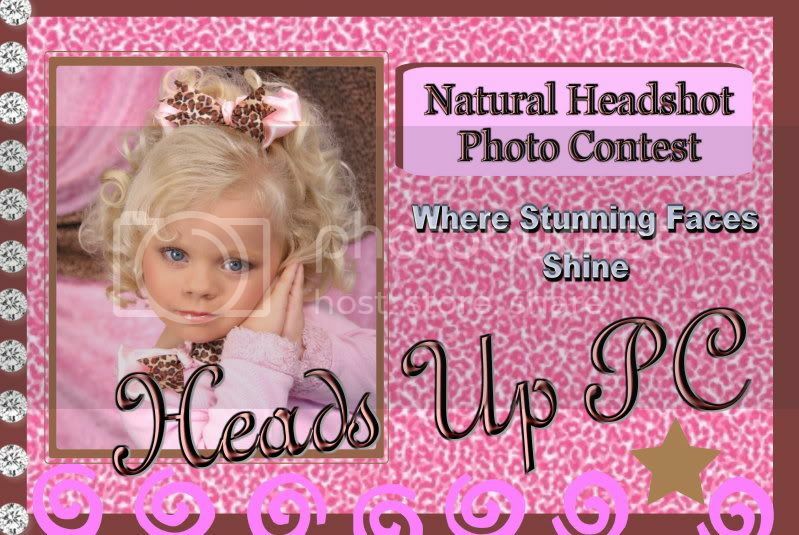 Beautiful Faces Weekly Contest Deadline is EVERY SUNDAY @ 10:00 PM PST. RESULTS on Monday @ 10:00 PM PST. Winner receives an Advanced Whitening Kit from Doctor Smiles and $100 CASH! Prelims Going On Now in Kentucky & West Virginia, Enter Today! HAVE YOU SENT IN YOUR ENTRY YET??? We've Made Entering EASY!! Now You Can Enter Online!! prelim in your area email beautifulmeproductions@yahoo.com for information! If you are interested in attending Beautiful Me and we didn't offer a prelim in your area email beautifulmeproductions@yahoo.com for information! Tall women. Tall women can indulge in wide belts, avoid tight clothes and skirts that are to short or to long. Beauty expert Stephanie Faber recommends tall women play down their waist by wearing their blouses over the pants and skirts and avoid tight belts. Hip heavy triangle woman. A hip heavy triangle and round full figured women can use clothes with vertical lines to make an up and down illusion. V-necks and skirts with slits up the sides are also good. Clothes with small padded shoulders should be chosen . Too big of pads will make you look like a foot ball player. Wear long tops that go passed your hips. Choose jackets, tailored suits and shirtwaist dresses with straight, classic cuts. Lighter colors on top can be worn, this brings eyes up. Wear dark stockings and avoid patterns. Select vertical, fluid patterns and avoid bulky fabrics. Adopt the just below the knee look in dresses and skirts. Choose accessories close to the same color clothes you are wearing including shoes. This gives your body an unbroken slimmer look. Avoid very wide pinafore skirts. Stay with straight or Aline skirts. Top heavy woman. The top heavy body types need to choose long jackets without shoulder pads. Do not wear blouses with fancy details and ruffles. Do not wear clingy fabrics on top, choose darker colors on top. Do not wear tops that are to light. Tops with dolman or raglan sleeves and ones that fit loose and slims down to hug the hips and waist are good. Wear pants or skirts that are pleated to bring the eye down. Choose thin materials like cotton, or cotton jersey. One color dressing will also be thinning. Flat shoes are best unless you are short, then wear heels. If your legs are in good shape shorter hem lengths will draw attention away from your top. Rectangular type woman. The rectangular type can accentuate curves by wearing jackets or tops that hug the waist, feminine thick sweaters over skirts or pants. Use patterns in your tops or bottoms to add dimension. Round out the neckline with necklaces, scarves and other accessories, and use shoulder pads. Saturday February 13th at the Budget Inn in Hurricane...Don't miss it!!! fee paid to national finals, trophy and a lovely gift! Please click on banner to Email Angela or phone: 606-526-9058 to reserve your shoot! Booking now for Hurricane, West Virginia * February 14th only! Friday, February 5th, Muncie, IN Muncie Mall Registration: 6:00 p.m.
Saturday, February 6th South Williamson, KY Southside Mall Registration @ 1:00 p.m.
Saturday, February 6th, Kokomo, IN Markland Mall Registration: 1:00 p.m.
Saturday, February 6th, Lafayette, IN Tippecanoe Mall Registration: 6:00 p.m.
Sunday, February 7th, Indianapolis, IN Castleton Square Registration: 1:00 p.m.
Saturday, February 13th Ashland, KY Kyova Mall Registration @ 1:00 p.m.
Saturday, February 13th Hurricane, WV Budget Inn Registration @ 6:30 p.m.
Saturday, February 20th Williamsburg, KY Registration @ 1:30 p.m.
Saturday, February 27th Hindman, KY Holly Hills Mall Registration @ 1:00 p.m.
Sunday, February 28th Danville, KY National Guard Armory Registration @ 1:30 p.m.
Don't Miss the Porcelain Dolls Early Bird!! Want an extra $400.00 for your piggy bank? Don't Miss the Porcelain Dolls Earlybird - It's That Simple! EARLYBIRD ENDS JANUARY 15 - ABSOLUTELY NO EXTENDING!! What Will You Do With The $400 You Save? What You Do With The $400.00 You $ave is Entirely Up To You! Just Don't Miss the PD Jan 15th EB Deadline! "As You Can See It Is About the Face"
not a Total Package Pageant. We want to see your beautiful face!! Coaching with Ashley in West Virginia!! Come Strutt with the Best!! Lexi is winning with her Toni's! Lexi says you Gotta Love Toni O! 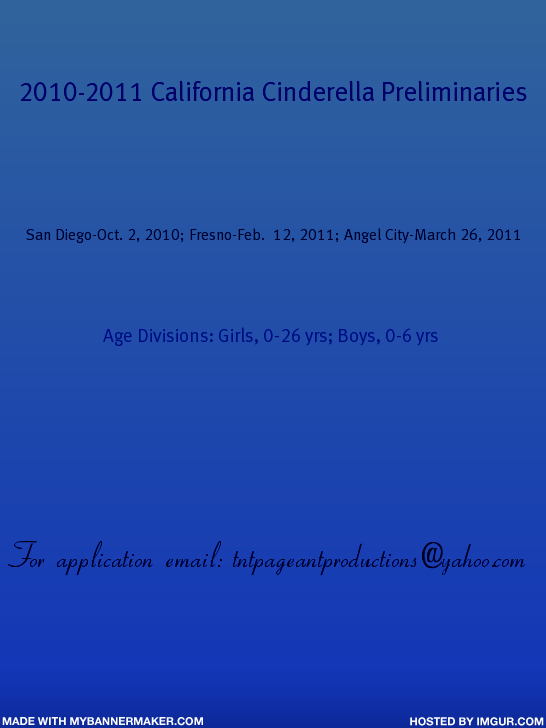 Supplying you with all of your pagent needs! 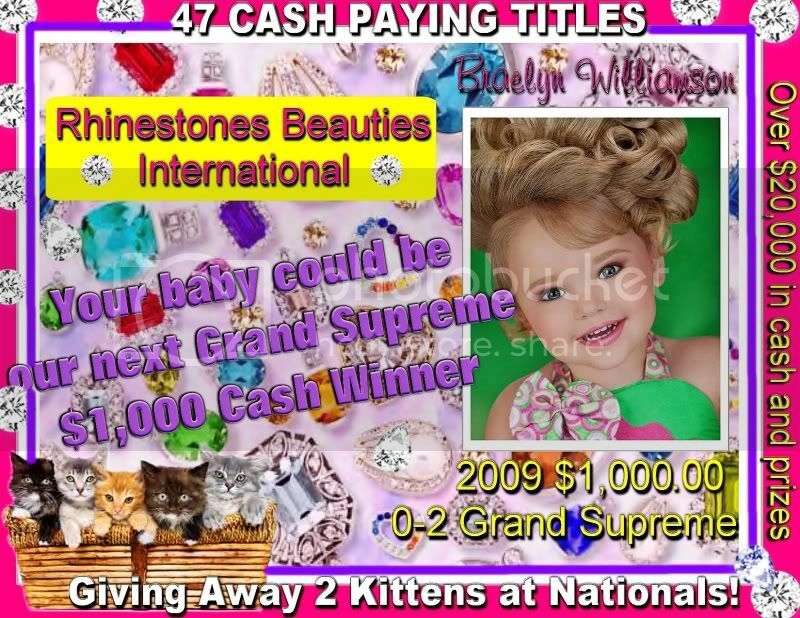 JOIN BRAELYN FOR A FUN, FAIR & FABULOUS NATIONAL YOU COULD BE OUR NEXT 0-2 GRAND SUPREME $1,000.00 CASH WINNER! ....plus an incredible gift & prize package like no other!!! Glamour Girls Hotel Will Sell Out!!! our hotel will sell out!! Trinity Has Exciting GG News!!! All It Takes is Beauty + One! for your 2nd Outfit of Choice! Want to Enter Glamour Girls FREE??? Glamour Girls entry is FREE!!!!!! There's Still Time to Enter AGM!!! AGM is beauty + your ONE highest optional! 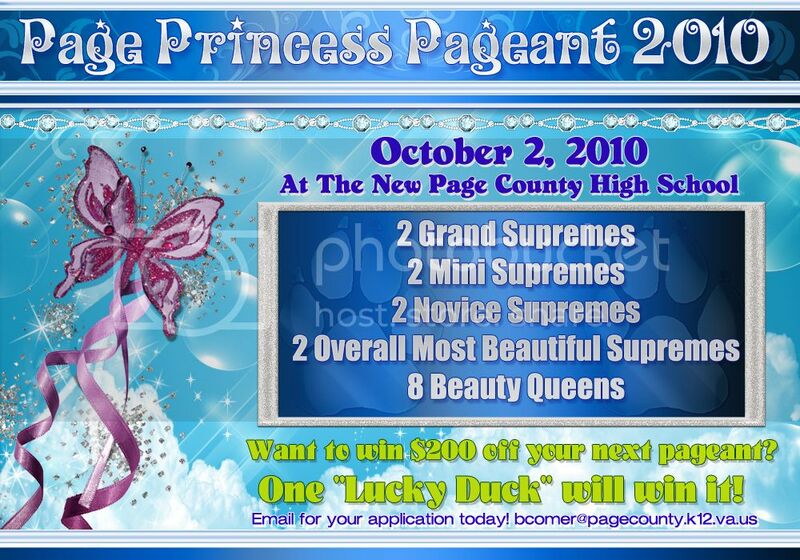 Don't miss one of the most fantastic face pageants of 2010! Have you seen the great optional events AGM offers? Don't forget! AGM is beauty + your ONE highest optional! such as glitz photo and natural photo, print model, etc. It's all about a pretty face at AGM! Isabel Can't Wait for the Last Weekend in May!!! Porcelain Dolls 2010 Will Be THE Pageant of the Year!! Over $70,000.00 in cash, bonds & prizes to be won! Surprises Galore Await All Who Attend Porcelain Dolls!! Porcelain Dolls 2010 Will be Bigger & Better than Ever!!! "Eden Wood: From Cradle to Crown, A Life in Pictures"
Release Date February 27, 2010! All Pre-Orders receive FREE Shipping and will be signed by Mickie and Eden Wood! Early Bird Photo Contest Deadline Dec. 28, 2009! 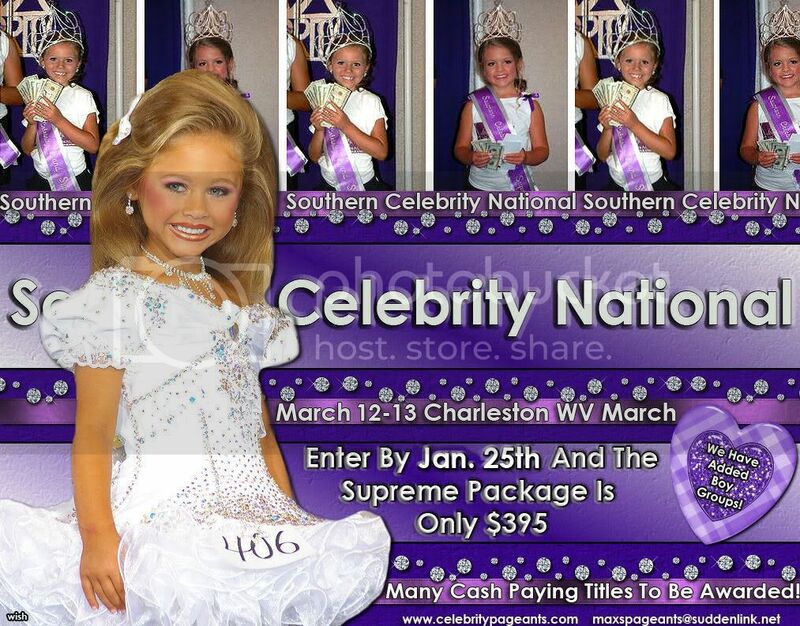 3 Grand Supreme winners will win $250 off their Supreme Package! 3 Mini Supreme winners will win $200 off their Supreme Package! 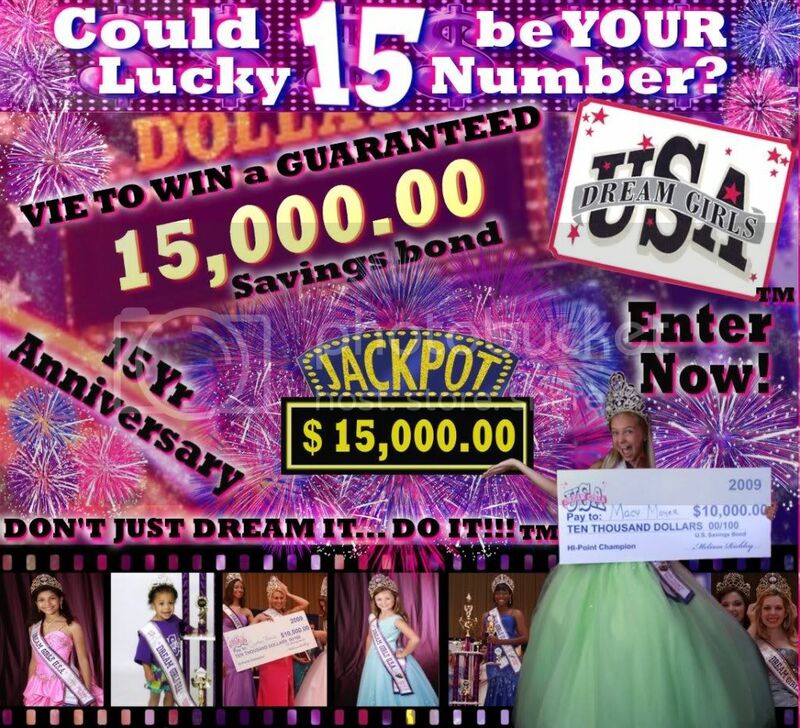 11 age Div Queens will win $150 off their Supreme Package! Every PC contestant will receive $50 off their supreme package! The Porcelain Dolls Earlybird is Fast Approaching! WOW that's a $400 Savings!! Congratulations to our 2009 Virginia�s Majestic Miss Pageant Royalty! Ashley will be in Richmond & Charleston This Weekend!! & Start Bringing Home Your Supreme Titles! Book an Hour @ ECUSA - Get a FREE Extra 1/2 Hour! Book an Hour - Get a FREE Extra Half Hour!! Everyone will receive at least a crown, gift and fees off the 2010 National. 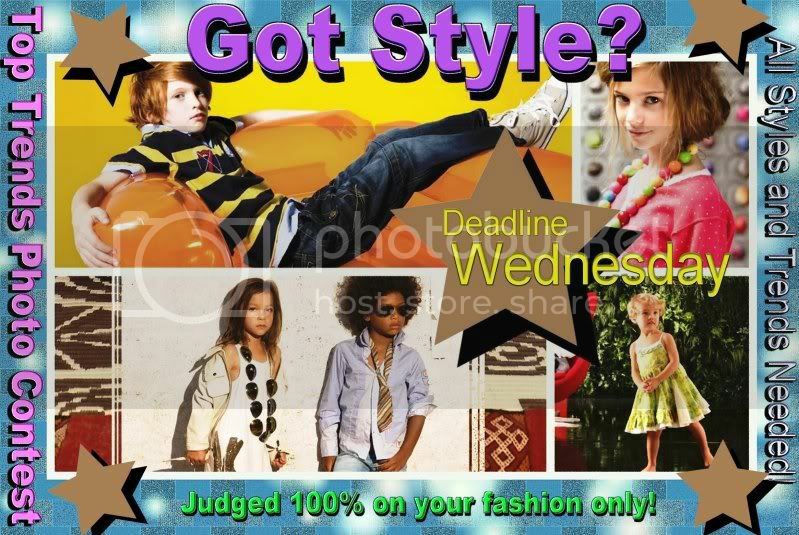 Trying to find a way to enter the exciting and glamorous world of modeling now�s your chance!!! Great opportunity to be educated and discovered! 0-12 years- Enter for a chance to win a 25,000 grand prize college tuition fund, flown to New York with a three day get away, press conference, and photo shoot. (Must bring head shot). All winners will be named WV Models per division and a chance to speak with agents and a photo shoot will be scheduled with a fashion photographer and have a test shoot for New York agency submission! in your new DBH Dress! You looked beautiful! Program Book and Door Badge..
NO surprises at the door! The Princess program will have a princess (dress up like your favorite princess) party at Memorial Regional Medical Center in the main conference room on Oct 24th from 2-4. This is a way for the princesses of Miss Piedmont Region to get to know us and meet each other before the pageant and meet our Miss, teen and preteen titleholders. It will be so much fun! If you know of a young lady interested in the Princess program with Miss Virginia please contact us. We are accepting the first 10 applicants ages 4-9. They will reign in the Miss Piedmont Region program along with the Miss, Teen and Preteen for the year. Also they will be crowned formally on pageant night and be our hostess for the evening. * Be mentored by Laura Pennington, �Miss Hill City 2009� and Amanda Jones, �Miss Star City 2009�. * Appear in the Lynchburg / Roanoke Christmas Parade in December 2009. * Represent the �Hill City� or �Star City� making public appearances and performing community service. 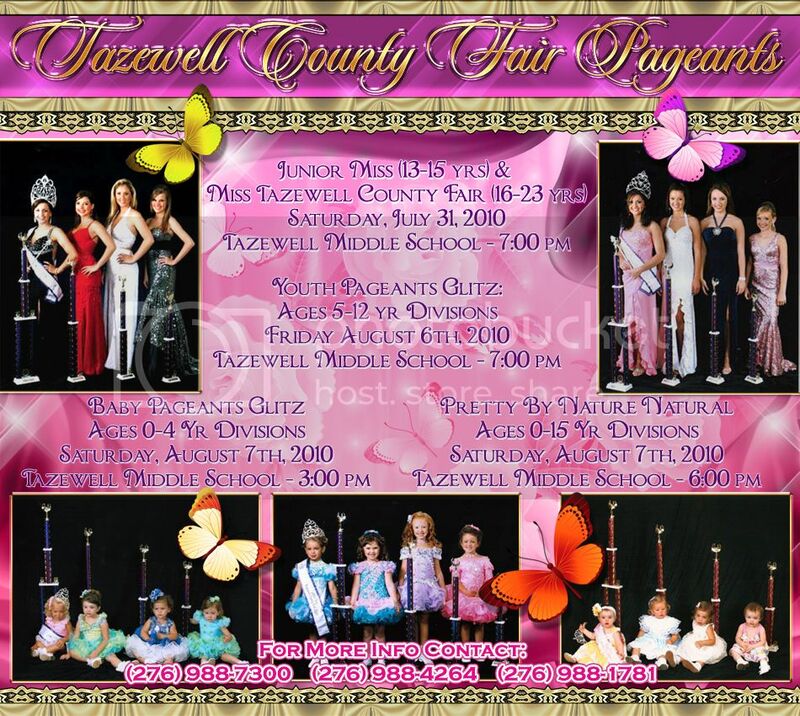 * Teen & Pre-Teen winners advance to Miss Virginia�s Outstanding Teen & Pre-Teen Pageant in June 2010. 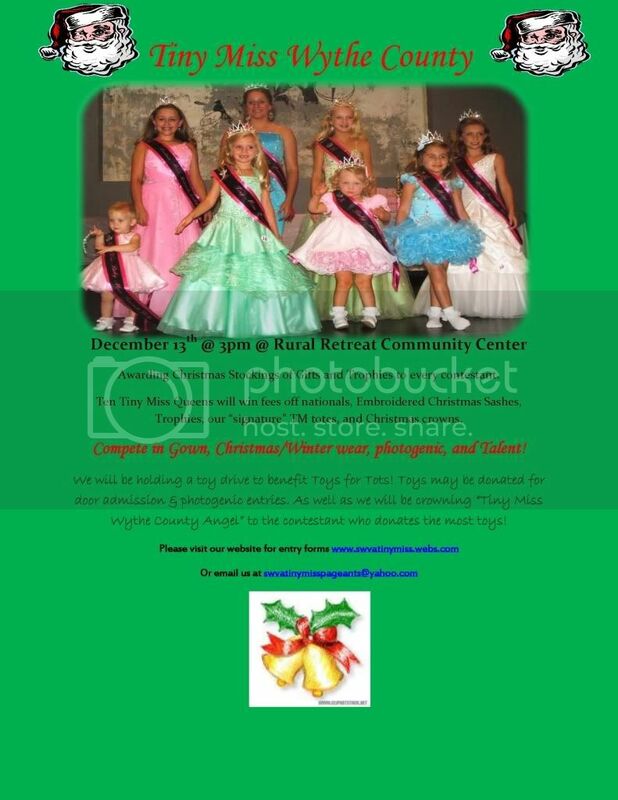 * Petite & Little Miss winners have the option of participating in the Miss Virginia Princess Program in June 2010. State Directorships Available! E-mail For Information. For questions please email for more info!!!!! We are looking for a pretty face with a sparkling personality. There is no pageant experience necessary! 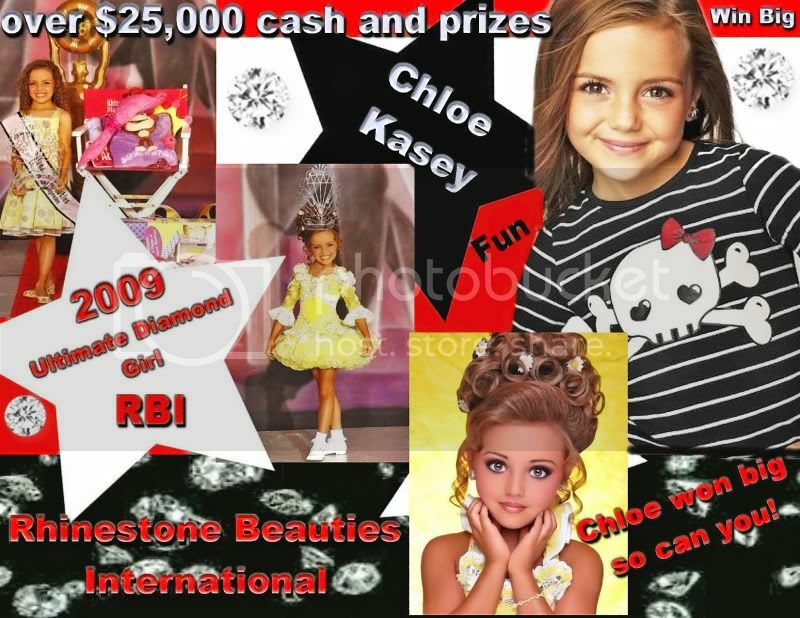 Our pageant is a perfect pageant for all contestants. Attire is Sunday Best or a cute Spring outfit. There is NO pageant attire, fake hair, or flippers allowed. Makeup is allowed but should only enhance the child�s beauty. All contestants will receive a tiara and an embroidered sash. 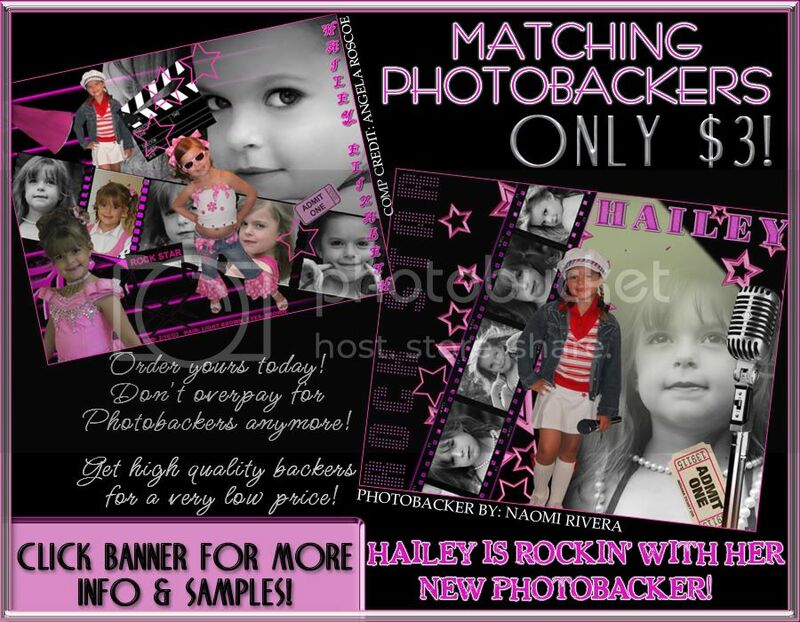 plus get a free photo backer made!! 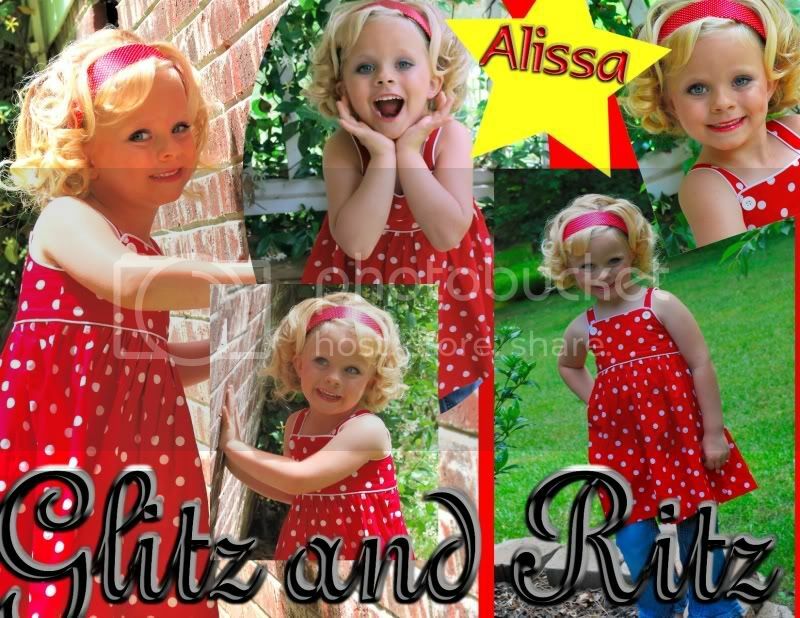 GLITZ AND RITZ PHOTOGRAPHY Alissa Got her Naturals!